Synthetic peptide within Human p38 aa 150-250 (internal sequence). The exact sequence is proprietary. WB: Jurkat, C6, NIH/3T3 or HeLa whole cell lysate (ab150035). ICC/IF: NIH/3T3 cell lysate. Shipped at 4°C. Store at +4°C short term (1-2 weeks). Upon delivery aliquot. Store at -20°C long term. Stable for 12 months at -20°C. Our Abpromise guarantee covers the use of ab170099 in the following tested applications. 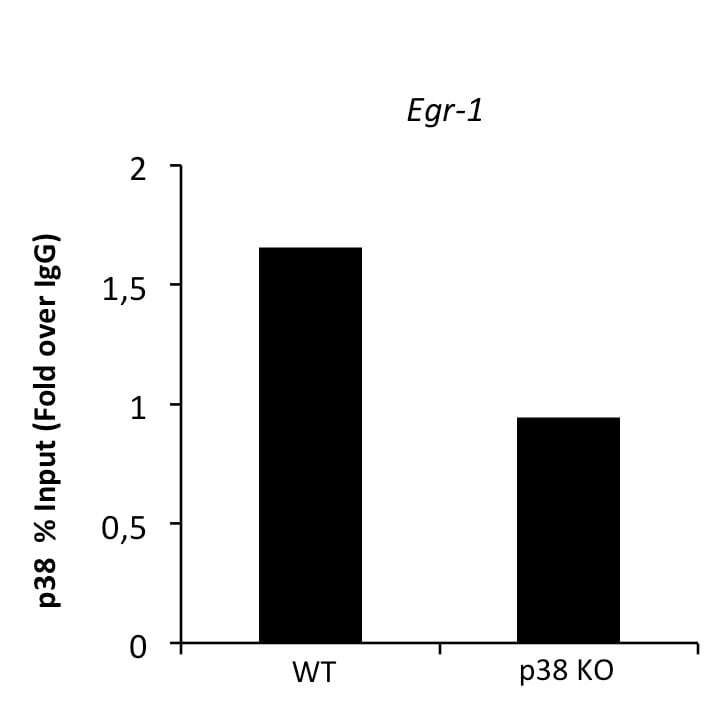 Responds to activation by environmental stress, pro-inflammatory cytokines and lipopolysaccharide (LPS) by phosphorylating a number of transcription factors, such as ELK1 and ATF2 and several downstream kinases, such as MAPKAPK2 and MAPKAPK5. Plays a critical role in the production of some cytokines, for example IL-6. May play a role in stabilization of EPO mRNA during hypoxic stress. Isoform Mxi2 activation is stimulated by mitogens and oxidative stress and only poorly phosphorylates ELK1 and ATF2. Isoform Exip may play a role in the early onset of apoptosis. Brain, heart, placenta, pancreas and skeletal muscle. Expressed to a lesser extent in lung, liver and kidney. Dually phosphorylated on Thr-180 and Tyr-182, which activates the enzyme. Lanes 1 - 4: Merged signal (red and green). Green - ab170099 observed at 40 kDa. Red - loading control, ab8245, observed at 37 kDa. ab8245 (loading control to GAPDH) were diluted 1/1000 and 1/2000 respectively and incubated overnight at 4°C. Blots were developed with Goat anti-Rabbit IgG H&L (IRDye® 800CW) preadsorbed (ab216773) and Goat anti-Mouse IgG H&L (IRDye® 680RD) preadsorbed (ab216776) secondary antibodies at 1/10 000 dilution for 1 h at room temperature before imaging. Immunocytochemistry/ Immunofluorescence analysis of HeLa(Human epithelial cell line from cervix adenocarcinoma) cells labeling p38 with ab170099 at 1/250. Cells were fixed in 4% paraformaldehyde and permeabilized with 0.1% tritonX-100. 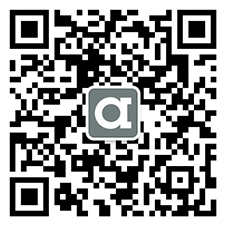 ab150077, an AlexaFluor®488 Goat anti-Rabbit IgG (1/1000) was used as the secondary antibody. The cells were co-stained with ab195889, an anti-alpha tubulin antibody [DM1A] microtubule marker (Alexa Fluor® 594) at 1/200. Nuclei counterstained with DAPI (blue). Confocal image shows nuclear and cytoplasmic staining on HeLa cell line. 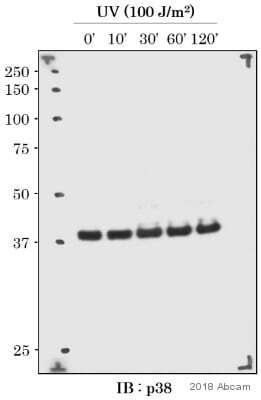 This western blot image is a comparison between ab170099 and a competitor's top cited rabbit polyclonal antibody. ab170099 (purified) at 1/20 immunoprecipitating p38 in Jurkat whole cell lysate. 10 ug of cell lysate was present in the input. For western blotting, a HRP-conjugated Veriblot for IP Detection Reagent (ab131366) (1/1,500) was used for detection. A rabbit monoclonal IgG (ab172730) was used intead of ab128913 as a negative control (Lane 3). Flow Cytometry analysis of HeLa cells labelling p38 with purified ab170099 at 1/40 (red). Cells were fixed with 4% paraformaldehyde. A FITC-conjugated goat anti-rabbit IgG (1/500) was used as the secondary antibody. Black - Isotype control, rabbit monoclonal IgG. Blue - Unlabelled control, cells without incubation with primary and secondary antibodies.